So now I am finally on my way, and have just spent two relaxing days in Singapore. Singapore is one of those places that I love to visit, but I am not too sure if I could live here. Its almost too organised and easy for me to live here. Don’t get me wrong, I am known for being pedantic about being organised (after all as you will now know I am a list writer)… but in my decision to move countries, I wanted to go somewhere that was a complete departure from my everyday life in Australia. Hence why I chose India, the country where chaos reigns and every minute is a new assault on the senses. My stopover in Singapore was just meant to give me a couple of days to relax and come down from the frenetic activity of the past few months. Upon landing in Singapore I had a splitting headache. This soon turned into a spasming back and a very uncomfortable couple of hours trying to get my back to settle down so I could actually get some sleep. All signs that the last couple of months had certainly taken their toll. Then I awoke to a sultry 29 degress (C) and a stunning day. I just walked and walked, getting some heat into my muscles and bones that had been all but frozen in the Melbourne winter. 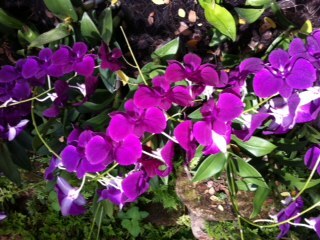 Singapore is famous for its orchids. They are a stunning plant variety. So delicate, two equal petals and then a delicate lip that hangs over with such grace. 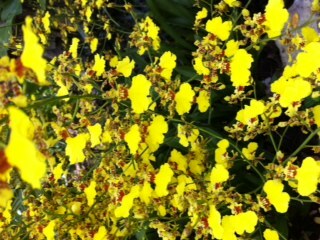 They come in any colour imaginable, such beauty I don’t think can be equalled in the botanical world. At the Singapore Orchid Garden in the Botanical Gardens I wandered through for hours just savouring each and every glorious petal. There is a serenity in that garden, such peace can be found in beauty. Its the first time in months I have had time to just stop and appreciate beauty for beauty’s sake. Now I am excited about my impending journey, I can’t wait to have the time to appreciate the colour and beauty of my new home. Until then…. take some time to smell the um …. orchids!